Thank you for considering Denver, The Mile High City, for your conference. VISIT DENVER offers free services to assist you in finding a suitable location for your meeting or convention. 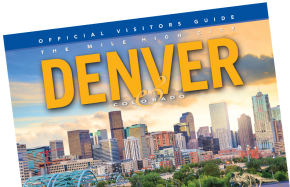 If you have a detailed RFP already prepared, please email it directly to sales@visitdenver.com. Otherwise, you can fill out an RFP form. For meetings that do not require a room block, visit the Submit a Service RFP Page. Denver offers more than 11,000 hotels rooms near the Colorado Convention Center and 50,000 metro-wide. Use search tools to find one for your conference or meeting! Planning a small meeting, large corporate meeting or conference? Denver has the ideal venue & facilities. Use our search tool to find a location! Check out the Colorado Convention Center's six-month convention planning calendar with attendance numbers. Plan your meeting, tradeshow, conference or event at the Colorado Convention Center in the heart of vibrant Downtown Denver. Submit an RFP today!